Galloway Forest Park has been acknowledged as one of the best places in the world for astronomy. 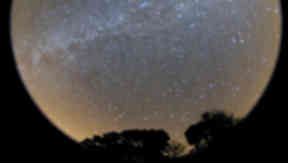 The area has been named the first Dark Sky Park in the United Kingdom, an international award from the International Dark Sky Association (IDA) that acknowledges the area is has little light pollution, making the night sky cleared to see. Until now, there have been only three other Dark Sky Parks in the world - the Natural Bridges National Monument in Utah, the Cherry Springs State Park in Pennsylvania and the Geauga Park in Ohio. The status is awarded to places with a minimum amount of light pollution, making them ideal places for stargazing and viewing the faint light of distant stars. Forestry Commission Scotland has worked with the local Wigtownshire Astronomical Society, lighting experts and the surrounding community to ensure Galloway's skies remain pitch black - the best condition for viewing distant galaxies. the moon and I'm thrilled for them and for Scotland. for attracting more tourists to the area." Work on achieving Dark Sky Park status began last year, with a formal application being submitted to the IDA six weeks ago. The final awards were decided at the Association's AGM being held in Phoenix, Arizona, over the weekend. Martin Morgan-Taylor, UK board member for the International Dark Sky Association said: "Galloway Forest Park is a fantastic asset in the now international network of Dark Sky Parks. "A core aim in creating such a park is to identify and honour protected public lands with exceptional commitment to, and success in implementing, the ideals of dark sky restoration and preservation. Galloway has shown exceptional commitment here in the UK, and the team deserves the highest commendation and recognition. "Its location is ideally situated for access from Edinburgh, Glasgow, Belfast and northern England meaning that many people, including children, may have access to a quality night sky, both now and in generations to come. Such skies are rapidly disappearing and less than ten per cent of people in the UK can now see the Milky Way from where they live." Galloway Forest Par, located in the South West of Scotland, is the largest of its kind in the United Kingdom and was established in 1947. The forest park covers 300 square miles - around six times the size of Glasgow - and is managed by Forestry Commission Scotland.